a muslim homeschool: Printable Arabic alphabet flashcard / posters, with harakat. 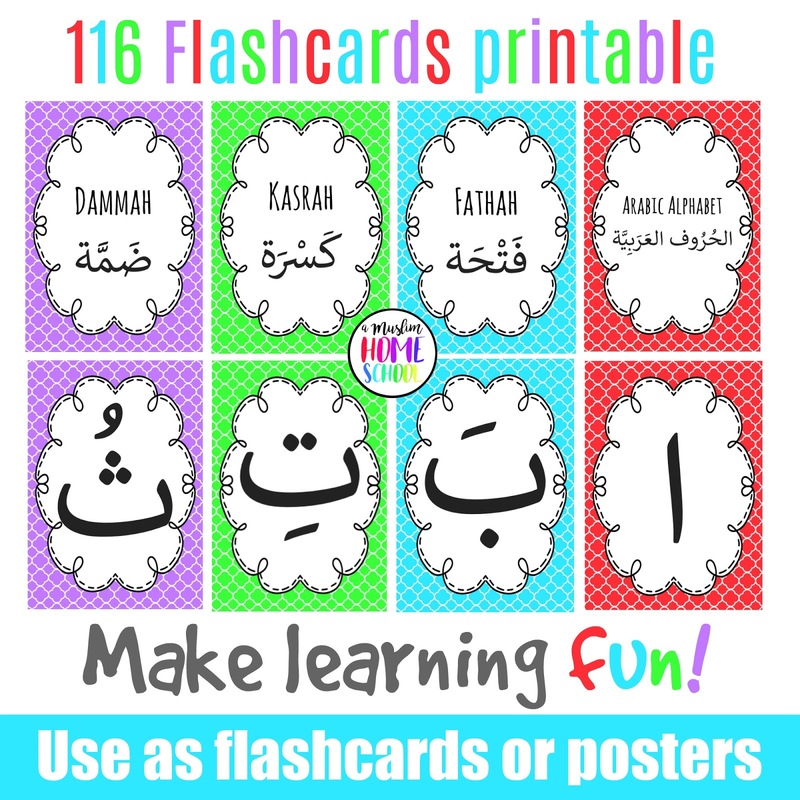 Printable Arabic alphabet flashcard / posters, with harakat. If you're like most Muslim parents, helping your children learn the Arabic alphabet is important to you. 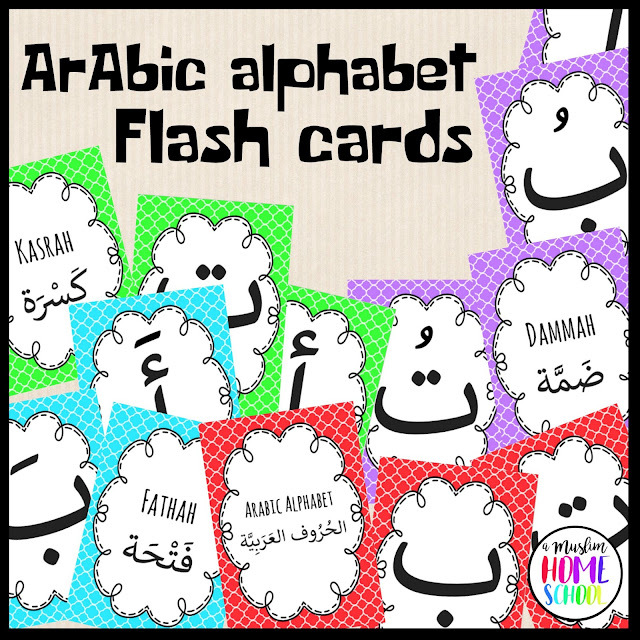 These fun colourful Arabic alphabet cards are just the thing to help inshaAllah. The internet brings to us a wealth of information and resources to our fingertips like never before Alhamdulillah. No longer do we have to scour the high-street searching for what we want to find. With a few clicks of a button, we can discover what the world has to offer us. I remember when my children were younger, all I had to teach the Arabic alphabet was a large poster hung up on the wall and one or two poor quality board books.....which I treasured! In just a short few years, as more and more of us are deepening our desire to nurture our childrens curiosity and engage them in their learning adventures, more and more of us are turning to the internet to find awesome resources we can print at home, saving us £££s. These Arabic alphabet cards are something I created that I would have loved to have had when my children were pre-schoolers, as I believe it would have helped tremendously in teaching the Arabic alphabet and early development of Arabic reading skills, and Allah knows best. They can be used as A4 posters, or flashcards....adjusting your printer settings to reduce the size as you choose by simply printing multiple pages per sheet to give you either A5, A6 or A7 cards. If you like them as posters, create an awesome wall display somewhere your child will see them every day! If you prefer them as flashcards, play games like snap, by printing 2 sets of the stand alone Arabic Alphabet set. Another game if you printed 2 sets, is to play memory snap, by placing all the cards face down and picking 2; if they match the player keeps them, if not return them face down and the next player takes a turn. To purchase, you can pay securely through paypal using the button below, and I will send your pdf file manually to your email address (I will send to the address used to pay paypal unless you leave a note with a different preferred email address) within 12 hours of purchase inshaAllah. If you order, I'd love to hear how you use them! To see how one family has used the cards, visit Ever Learning Ever Lasting where you can read a review and see photo's of how one family has decided to use the Arabic alphabet Flashcards.